April 30, 2017, was Confirmation Sunday. I listened to eighth and ninth graders speak their “credo,”…that to which my heart clings. Recent rulings within The United Methodist Church have moved me to state that to which my heart clings and where it is I stand. I boldly speak against the injustice and discrimination toward LGBTQ persons, their families and allies that yet remains within, and is supported by, the policies and people of The United Methodist Church. I announce the harm that is being inflicted over and over again to LGBTQ persons, their families and allies. This is not “an issue.” This is about real peoples’ lives, literally. I call upon allies and families to add their voices, time and resources to protest this devastating attack on LGBTQ people that is an affront to the Gospel of Jesus Christ. I will not make any further financial contribution that supports the institution through apportionments. I know apportionments support good things, too. This does not give me pause. I easily find ways to continue my financial support of the good work in a local church as well as similar efforts for justice and compassion outside of the Church. I dissent in place and will not leave The United Methodist Church. I keep my clergy credentials. The church is a vessel. God has ordained me. No one can take that from me. The April 28, 2017, ruling of the Judicial Council regarding, “can a gay clergyperson serve as a bishop?” (my summary) and the possible judicial or administrative process that may unfold in Bishop Oliveto’s Western Jurisdiction, has made it very clear what The United Methodist Church is all about when it comes to gay clergy and their appropriateness for ministry. It is this crazy “practicing” language. “Self-avowed practicing homosexual…” You can be gay, you just can’t “practice.” So it all boils down to genital sexual contact. I sat at a church trial a few years ago and listened to the Counsel for the Church ask the clergy on trial, “Have you had genital contact with your partner?” That is where the United Methodist Church is focused. Shameful. Disgraceful. It leaves us with people torn to pieces, literally, by that minefield of “faith-mines.” It leaves us with people being told they are outside of the love of God by a church that claims to have open hearts, open minds and open doors. It leaves us with Church leadership whose language and actions are absent of the compassion and justice we are all called to pursue. It leaves us as participating partners in a time in our national life that is fraught with shame, abuse and disregard for decency. It leaves us with people who can’t take a step back and catch their breath because every time they do, the church repeatedly knocks the wind out of them. When will I hear an official episcopal statement, or a bishop, say, “We/I so deeply lament the injustice and harm we continue to inflict on the LGBTQ community”? And if that has been offered and I missed it, I apologize to the speaker. I can only assume we are a denomination lead by sleep deprived leaders because I don’t know how one can sleep at night while this goes on – knowing you could do something about it and be somebody who speaks against this institutional harm. All of this…and more…is that to which my heart clings. This is where I stand today. Rev. Janet Ellinger, retired United Methodist clergy. The following letter was sent to the Council of Bishops and the Commission on a Way Forward in late April 2017. Below the text, a PDF copy of the letter sent is available. 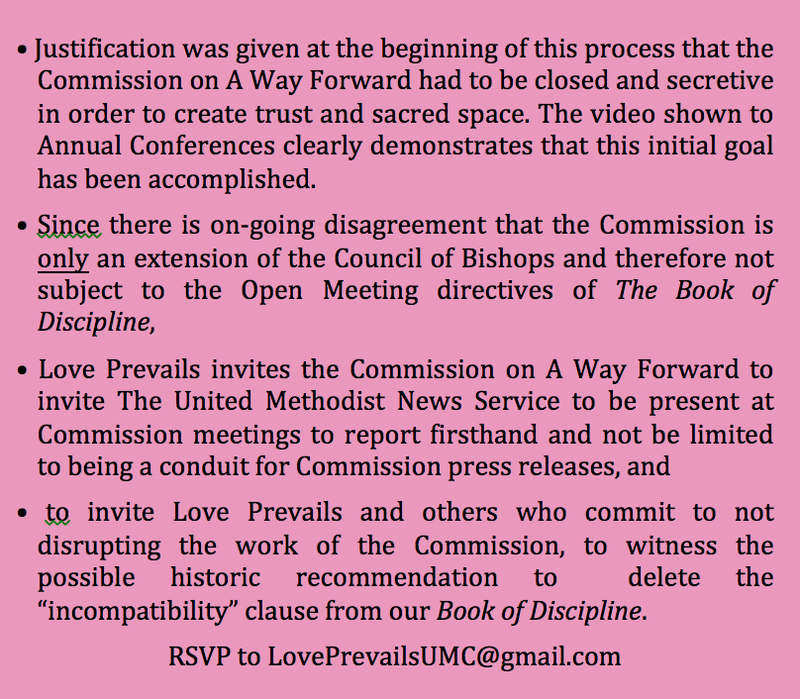 In April 2014, due to the efforts of Love Prevails, the Connectional Table began a process to formulate General Conference legislation that would call for the complete removal of all discriminatory language against LGBTQI people in The Book of Discipline. 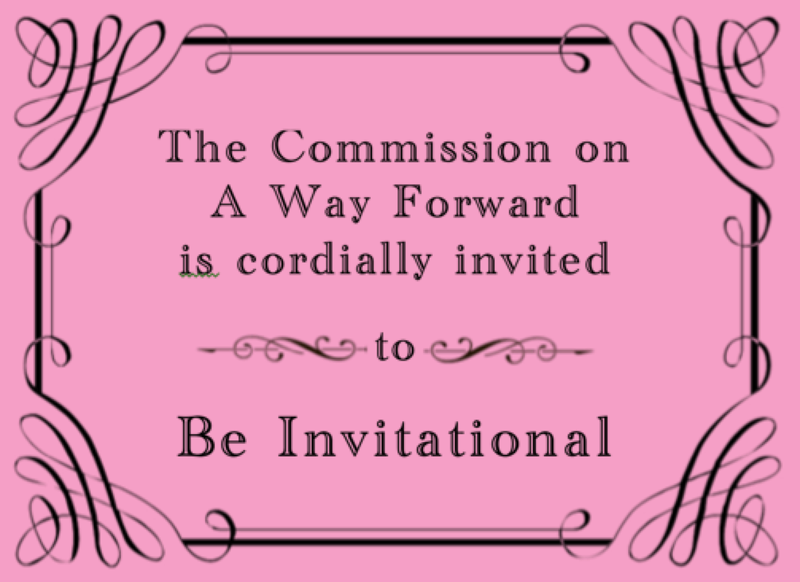 That attempt, however, was internally thwarted and The Connectional Table came to General Conference 2016 with a proposal called the Third Way. Now widely referred to as “The Local Option”, this approach enshrines the geographical discrimination of Queer people in our polity and sets up the highly destructive scenario whereby our very being will be debated and voted on in annual conferences and in our congregations. Such objectification damages the hearts and souls of Queer United Methodists throughout the Connection. Love Prevails has always opposed The Local Option because it is predicated on the notion that it is morally and theologically defensible to allow continued discrimination within certain geographic locations within our church; thus ecclesially sanctioning the spiritual abuse that accompanies this discrimination. There are some “progressives” within our denomination who believe that The Local Option is a good and helpful step that with time will eventually and inevitably lead to full inclusion for LGBTQI people. Love Prevails strenuously objects to this kind of thinking. This matter is far too urgent. “More time” translates as more lives lost. We believe that creating pockets of injustice is an intolerable solution which lacks the full force of gospel integrity that will ultimately delay justice for all, rather than hasten it. We see The Local Option as a seductive temptation that will lead to self-satisfaction and complacency. By now it is quite obvious that the Commission on The Way Forward is the very expensive method by which The Third Way, or The Local Option, will be repackaged. The processes by which The Commission seeks to “listen” to voices across the connection are nothing more than resilience-building sessions for General Conference delegates and annual conferences to desensitize themselves to regionally sanctioned discrimination, the United Methodist’s new normal. It seems clear that our United Methodist bishops are now moving to more fully support a Local Option because of political, not theological, reasons. Their priority is not justice, but institutional preservation, peddled as “unity.” Their desire to avoid a split and “save the denomination” comes on someone’s back—this time at the expense of Queer United Methodists. Love Prevails objects to institutional preservation over justice. When we object, it is not only because The Local Option will leave some Queer people dangerously vulnerable; it is not only because there will still be babies rocking in the cradles of anti-queer annual conferences who will grow to discover they are Queer and not want to relocate in order to find a church where they will be welcomed; it is because souls will be lost in The Local Option. Permissive and categorical discrimination kills the souls of LGBTQI people as well as the soul of the church. A church of Jesus Christ cannot survive or thrive with bigotry and intolerance in its heart – and the maintenance of such a church turns the proclamations of Belovedness made at our baptisms into propagandist lies. Love Prevails is neither for a church split nor against it. We do not advocate for it, but we also do not oppose the possibility. We persistently maintain that the only way forward is to remove all of the discriminatory language from The Book of Discipline. While full inclusion and justice will not happen immediately upon the removal of the language, there is no possibility for imagining real, comprehensive, intersectional justice or any notion of unity without first removing discriminatory language. The Episcopal Address 2016 focused on humility. St. Bernard of Clairvaux once summarized the four Cardinal virtues as, “Humility, humility, humility, humility”. This is a pleasant hook with which to begin a sermon/Episcopal Address. Examples of humility were related back to liturgical formulations that presuppose a community’s virtue to be held by each individual within it and that an individual’s humility is sufficient within a larger community that defines certain people out, regardless of their humbleness. First, a collect for purity: Almighty God, to you all hearts are open, all desires known and from you no secrets are hidden. Cleanse the thoughts of our hearts by the inspiration of your Holy Spirit, that we may perfectly love you and worthily magnify your holy name, through Jesus Christ our Lord. Amen. Any number of people can say these words and remain desiring and subversive of communal values that they might have the community reflect only their desires. Humility aspired to is not humility in deed. The limit of this intention comes when we get to the details of life, not its theory. As code language we can claim anyone as prideful if they experience and complain that the community has cleansed them from presence at the table (on either or both sides of it). Second, a prayer of confession: Merciful God, we confess that we have not loved you with our whole heart. We have failed to be an obedient church. We have not done your will, we have broken your law, we have rebelled against your love, we have not loved our neighbors, and we have not heard the cry of the needy. Forgive us, we pray. Free us for joyful obedience, through Jesus Christ our Lord. Amen. As noted in the sermon, the focus here is communal. Unfortunately a communal confession needs a communal repentance. Our usual process is to confess and confess for decades or a century before actually doing something about the pain inflicted on those who were powerless to effect an earlier change. The injured and their allies, not the community, are the humble. The application of communal confession to humility is very dangerous in allowing the community to be righteously blind about their doing harm. Confession does not do away with a need to change divisive legislation. Confession does not protect from “mutually assured destruction” when it covers the harm being done by intentionally denying God an ability to distribute gifts and graces to the youngest and the furthest outcast as God sees fit. Legislatively limiting God is certainly not a humble act and continuing it because the limits were repeated and hardened is no act of humility. Third, a Commendation and Welcome in the Order for Baptism and Reception: Do all in your power to: Increase their faith, Confirm their hope, and Perfect them in love. Who is being spoken to here? If it is General Conference in regard to current church members or a parent/sponsor in regard to an infant, there is no way to increase, confirm, and perfect without acknowledging that the mystery of spiritual gifts and personal identity is not in anyone’s control. They cannot be constrained to a desired outcome. It takes much humility to know the limits of what can be increased, confirmed, and perfected before these become requirements for one more closet. The address ended with a hymn, “God forth with God”. In addition to going forth in peace, love, strength, and joy. There is a question left about how humbly we will leave this General Conference. This question extends to what increase in peace, love, strength, and joy others will have as a result of our actual humility and not the use of humility as a further constraint on those without power to offer their gifts in a larger community of United Methodism or the use of humility as an accusation to make against those who would offer their gifts to transform the land, beginning with the church. What then is a legislative expression of humility at this General Conference regarding those lives have been injured through previous legislations? In particular, how might the presumption behind “the practice of homosexuality is incompatible with Christian teaching” finally be brought to its knees at this late date of 2016? to no longer be complicit with beatings? & you see it for what it is.